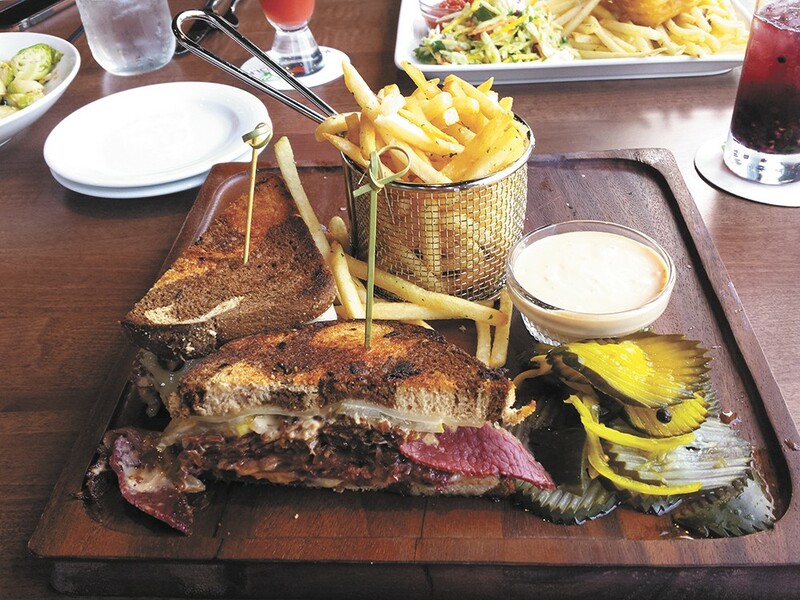 The Ultimate Reuben is one of the pub-style sandwiches available at 1898 Public House. When the Kalispel Tribe bought the former Spokane Country Club, they tapped Executive Chef Tyler Schwenk to come up with a menu that would appeal to the public long left out of the historically private dining room. "They were going after the gastropub theme," Schwenk says, "something family-friendly, a fun place to come four or five times a month, not just on rare occasions." Given Schwenk's background as former chef de cuisine at Beverly's at the Coeur d'Alene Resort, the chance of 1898 Public House being just another boring gastropub was pretty low. And the menu he came up with for the completely remodeled space overlooking towering pines and the golf course reflects his fine-dining bona fides, as well as the Northwest's love of a good pub. Sure, you can grab a burger or fish and chips and a beer while you watch one of the TVs in the bar area or sit on the patio, but the burger ($16) is served with house-cured bacon and Cougar Gold white cheddar, and the fish ($15 for two pieces) is fresh cod accompanied by crispy coleslaw and housemade cocktail sauce. And the drinks? There are 16 regional craft beers on tap (ranging from $5.50 to $8), along with an array of top-shelf liquor and craft cocktails. In creating the menu, Schwenk says, "I thought of things I loved when I was younger. Like, everyone loves mac and cheese, but how can I take it to the next level?" The answer: make it lobster mac and cheese ($22), with some savory seafood mingling in the fusilli pasta. The Lollipop Lamb Chops (two for $15), fried bologna sandwich ($13) and adult grilled cheese and sun-dried tomato soup ($14) all offer upscale takes on youthful favorites.